Debating Matters teamed up with STV to give secondary school pupils across Scotland the opportunity to debate the big issues in the run up to the referendum on Scottish independence in 2014. This unique competition, using the challenging Debating Matters format, and held in partnership with STV, gave secondary five and six pupils from all 32 Scottish local authorities - many of whom will have the opportunity to vote in the forthcoming referendum - the chance to research and discuss issues which will affect the future of Scotland. 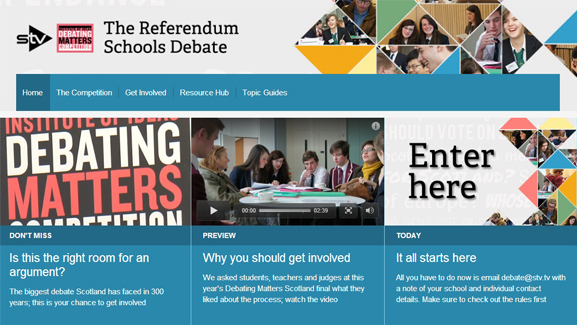 STV provided a platform for debate and covered the competition on air and online and Debating Matters produced special editions of our acclaimed Topic Guides on the motions for debate.